When you work at a place like Barkerville for as long as I have, you tend to think of life as a series of summer seasons, each with its own set of tiny quirks and big, defining moments. We are now into August, the homestretch, the last weeks of summer before we slide into the shoulder season of September. By August our bodies and minds are bit tired, and we sometimes find ourselves distracted by the realization that post-Barkerville life is suddenly within view – again. In August we also generally have a sense of how a season will be remembered in years to come. This season will be one the staff and interpreters of Barkerville think about for a long time. First of all, this was the one year in recent memory when we walked onsite in May and noticed a complete absence of the traditional, colossal spring snowbanks. Winter was mild, so we began our annual school program with ground that was free of spring runoff. Instead, the grass was green and we found ourselves speaking of the possibility of a long, hot summer. But that isn’t what actually happened. Yes, we experienced some extreme heat, but we saw impressive cold snaps as well. Yesterday was so chilly it felt like it might snow at any second, and now as August settles in some of the Cottonwood leaves are already changing colour. This is not the weather we were expecting. Barkerville is always full of surprises. We’ve experienced a major turn-around in tourism in British Columbia this season, and it’s been a welcome surprise. Numbers are up all over the province, and we have been enjoying a busy summer with bustling Barkerville streets. Performers love to play to large audiences, and some days the visiting population of our gold rush town has swelled to a thousand people or more. I enjoy every group I tour through town no matter how many guests are present, but nothing beats the excitement of a great big crowd travelling up the main street, sharing a common experience that my cast mates and I have had the privilege of facilitating. Barkerville’s Historic Street program, the interpretation program I am part of, saw the introduction of two new cast members this season, and they’ve been wonderful. The documented historical characters of Dr. Wilkinson and Miss Isabella Irvine are welcome additions to our roster, and the actors we’ve hired to play them have made a strong first impression. They are doing a great job, and we all enjoy working with them so much. This season not only introduced new interpreters to the streets of Barkerville, it also saw the rise of an exciting new display. For years we have wanted to recreate the original Barker & Co. Discovery Shaft and Shaft House, in its original spot in the centre of town, and this year we managed to do it. And all of it was captured on film by HGTV’s Timber Kings. We will always remember the excitement of watching the exhibit under construction, and once we’ve integrated the display into our programming after its official launch on Labour Day, we will no doubt look back fondly at this past spring, and the joy of seeing the artists from Pioneer Log Homes at work. So far it has been a season of both joy and sorrow. We have been knocked to the ground with grief at the loss of a dear friend and colleague, yet we’ve also been able to smile a little with the recent news of a baby born to one of our most popular interpreters and his partner, a woman who has lived and worked in Wells and Barkerville for most of her life. Sometimes life can bring unimaginable pain and enormous delight in such quick succession. 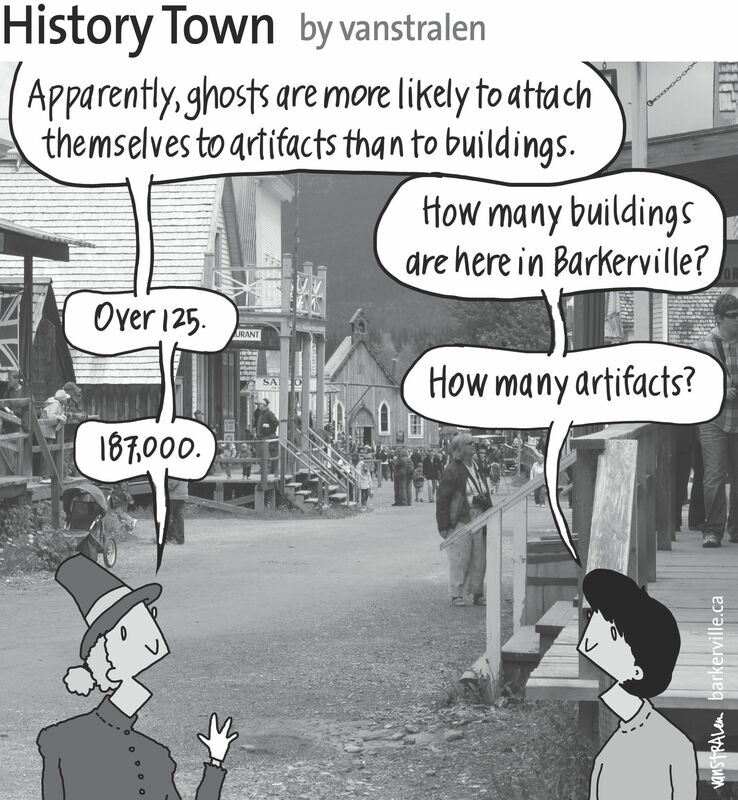 The above one-panel cartoon (originally published August 8, 2015) by Dirk Van Stralen, with accompanying editorial by Danette Boucher, is the tenth of twenty weekly entries that were logged – and subsequently blogged – as part of a 2015 collaboration between Barkerville, British Columbia and the Prince George Citizen aimed at introducing some of the quirks of living, working, and playing in the Cariboo Goldfields. We hope you enjoy!